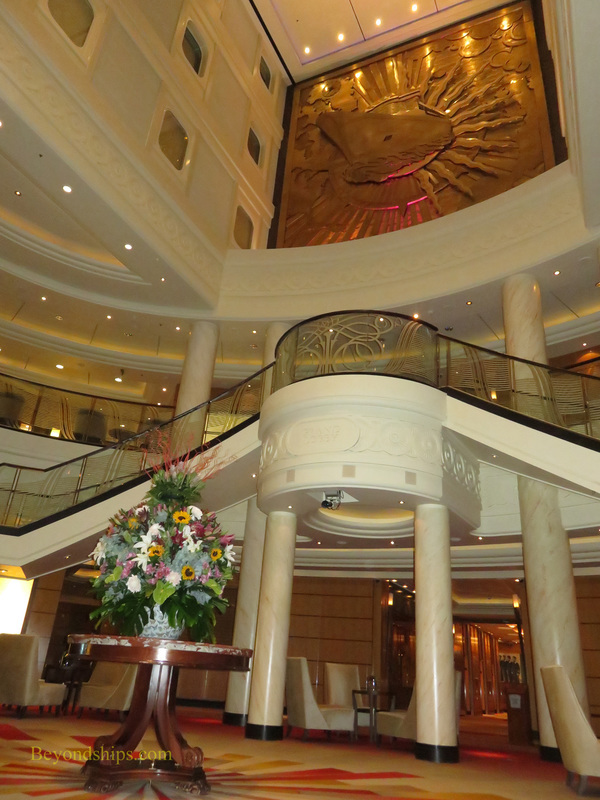 ​Below: Most guests first view of the ship's interior is through the Deck 3 lobby entrance. halt when she first appeared there, and even made New Yorkers take notice when she completed her first transatlantic sailing. advised that you will be missing out on part of the experience. Freedom of the Seas, which is about the same size, carries nearly 2,000 more passengers. Thus, one has plenty of space. coming over the public address system announcing various events onboard. There is no pressure; you decide what you are going to do. includes hostesses who are specifically assigned to taking care of the German passengers. It also tends to be an older group. There are facilities for children and teenagers, which are supervised by members of the cruise staff who are dedicated to taking care of younger passengers. 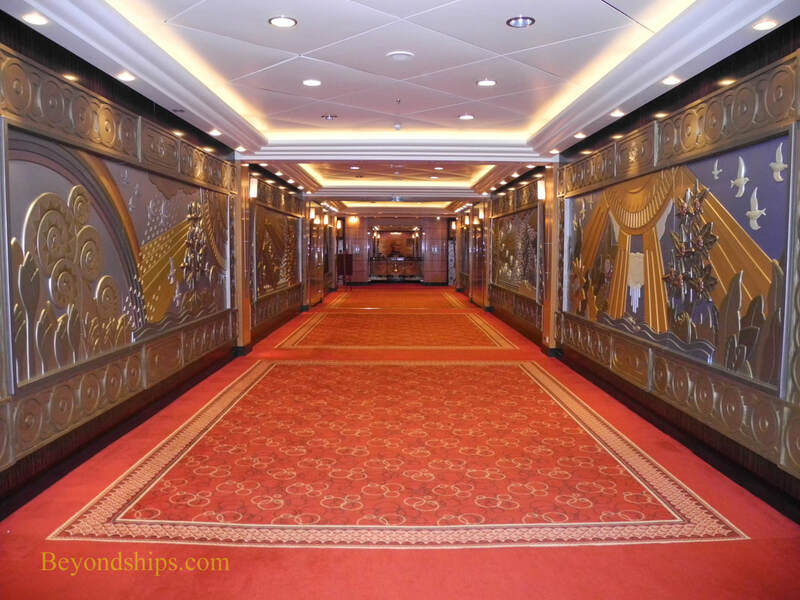 Some people are under the erroneous impression that QM2 is a two class ship. The reality is that there are separate restaurants for guests staying in the suites just as there are separate restaurants for suite guests on the most recent Royal Caribbean, Norwegian Cruise Lines, and MSC Cruises ships. 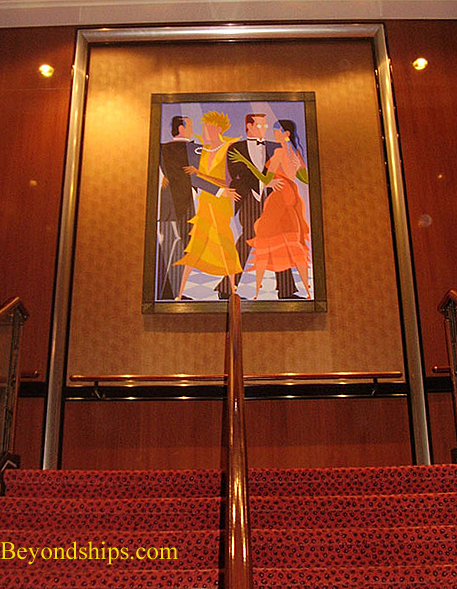 With a couple of exceptions, any guest can go most anywhere on the ship and see any of the entertainment. the bulk of her propulsion system is located outside of the hull in pods, engine noise does not ring throughout the ship. 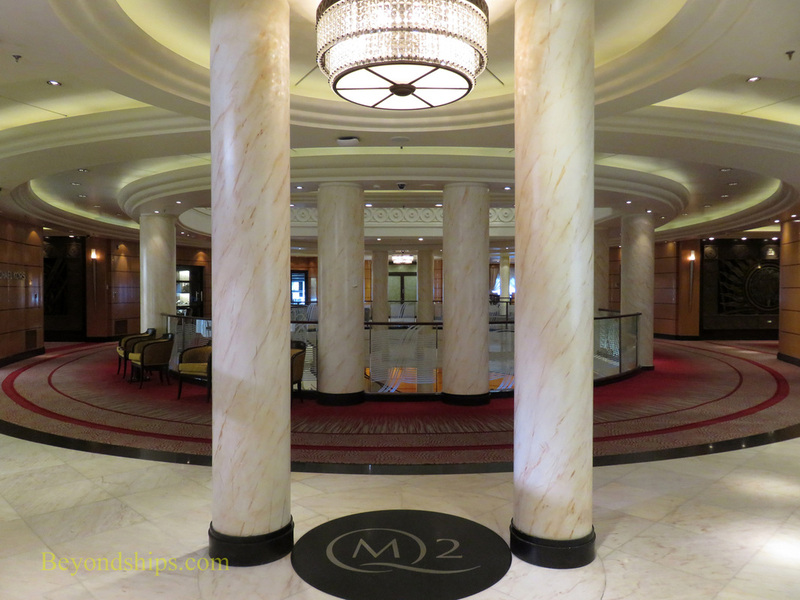 In 2016, QM2 underwent a major refit in Germany. New cabins were added and changes were made to several of the public areas. 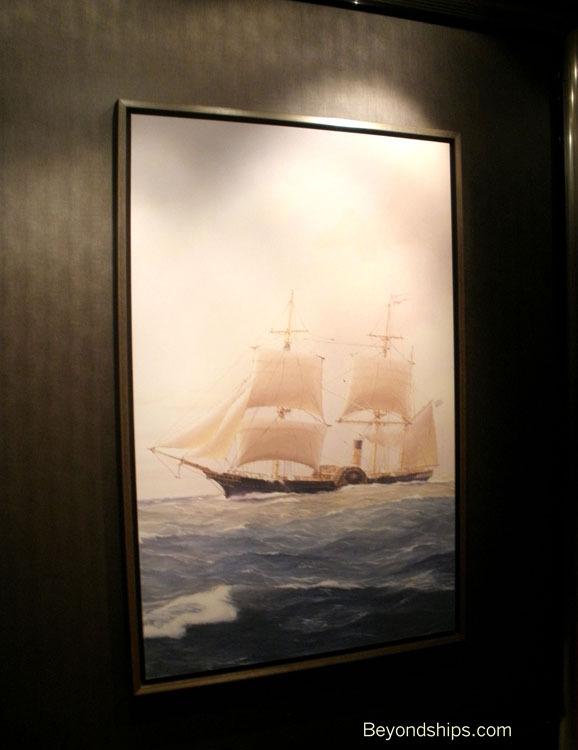 While the ship retains her original character, she has a refreshed look. 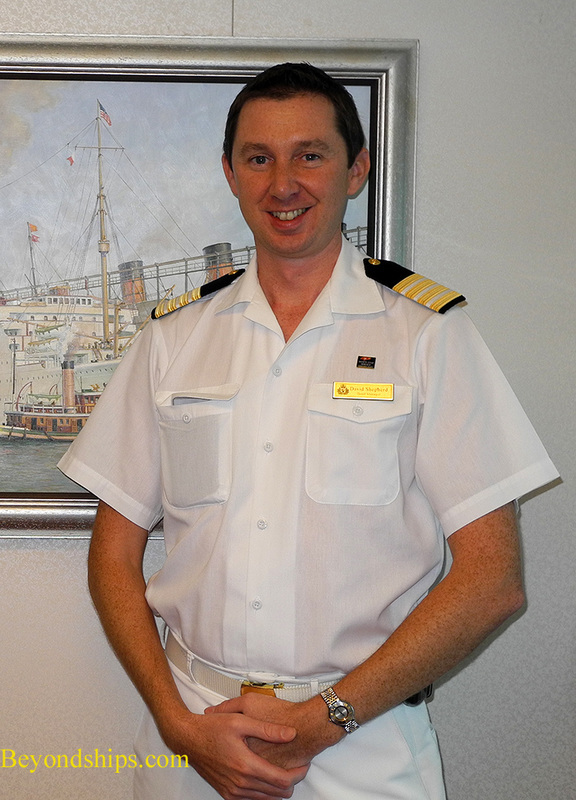 Above: Captain Christopher Wells (See interview). Below: Hotel Managers Robert Howie (see interview) and David Shepard (see interview). 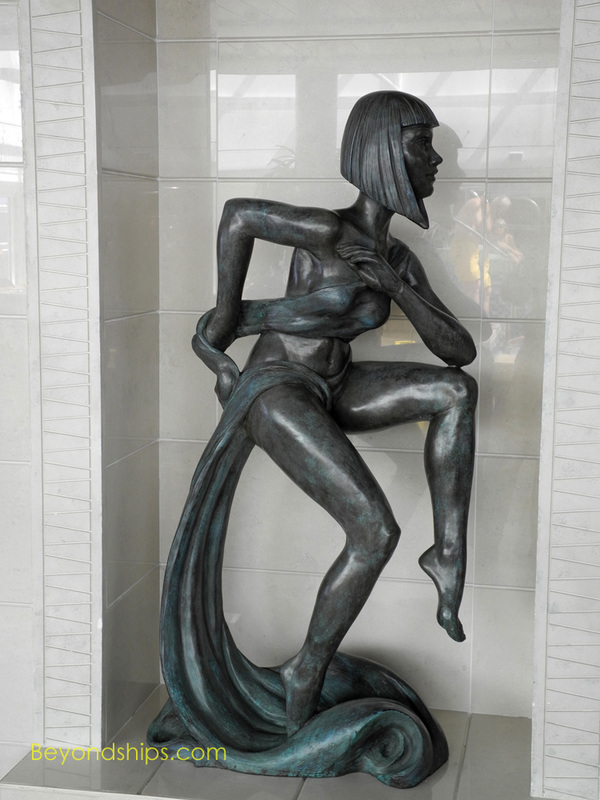 Cunard takes pride in its history going back over 175 years and that is reflected in the decoration of QM2's public areas. 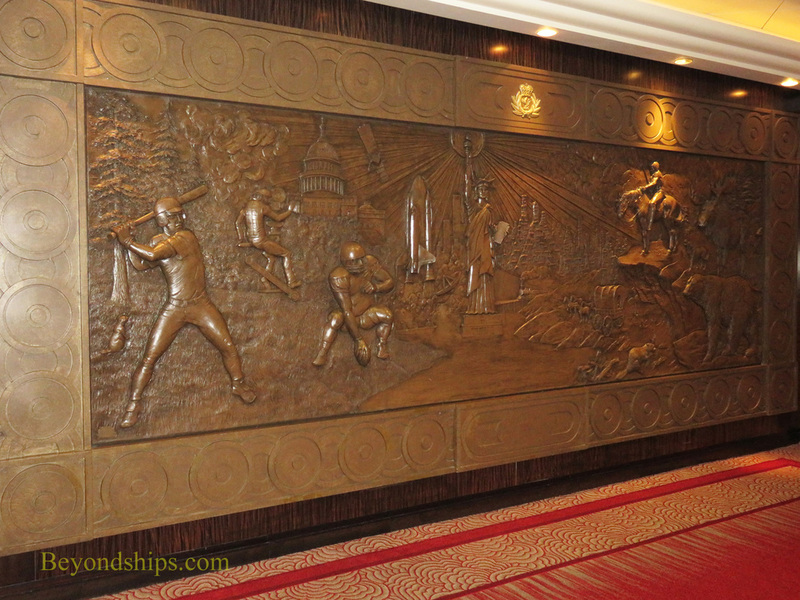 Large panels tell the history of the line, its ships and the famous people who have sailed Cunard (above). 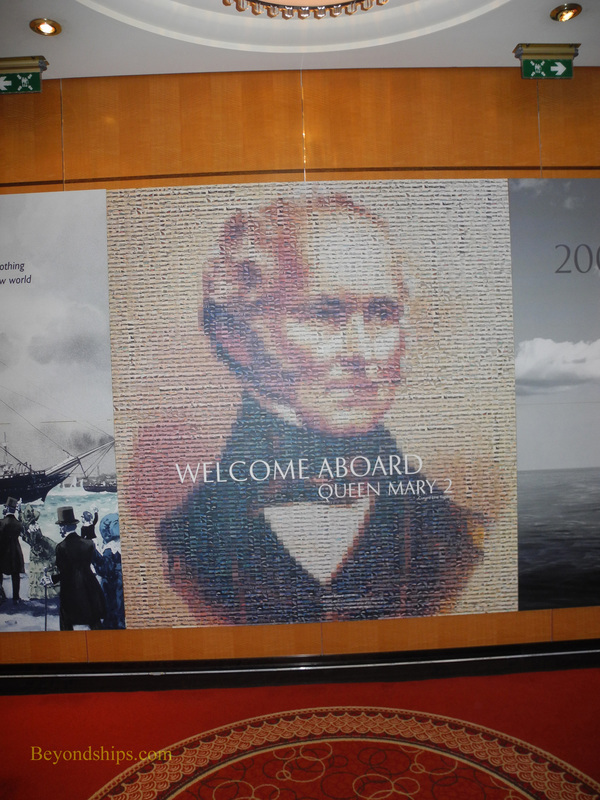 A mosaic in which pictures of the Cunard ships come together to form a portrait of founder Sir Samuel Cunard welcomes guests (below left). 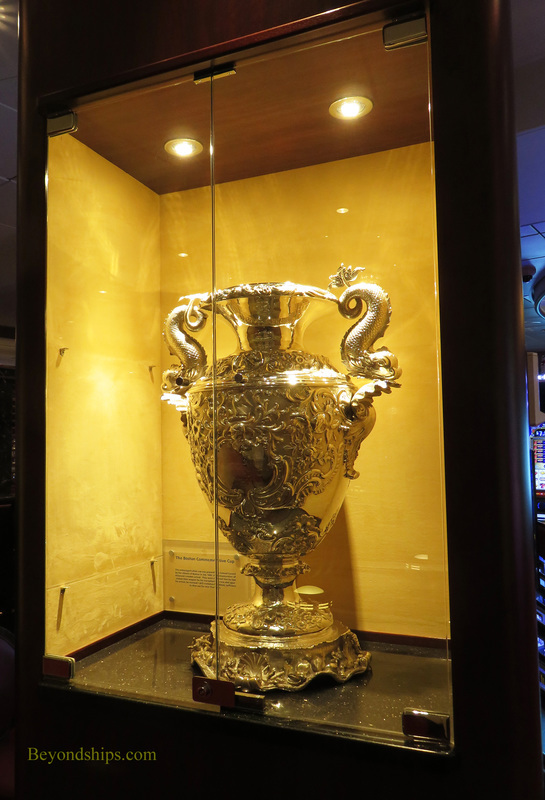 The silver cup presented to Cunard by the citizens of Boston after the line's first transatlantic crossing in 1840 (below right). 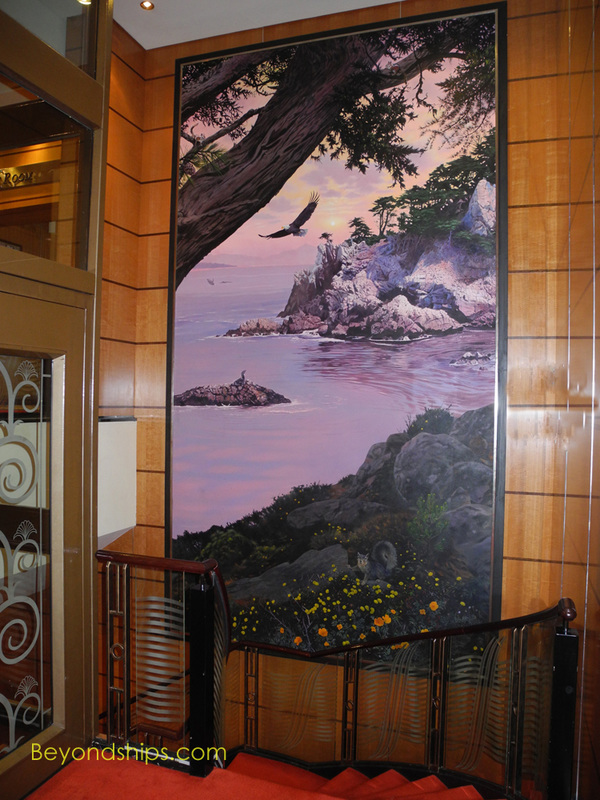 The center corridors cutting through the public areas on Decks 2 and 3 are decorated with large panels. 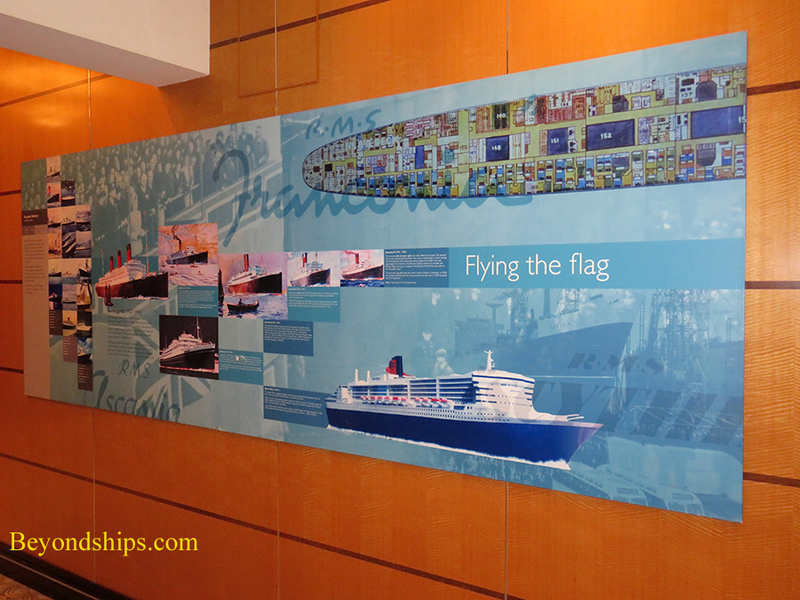 The reliefs on Deck 2 present images that are characteristic of the contients to which Queen Mary 2 sails. 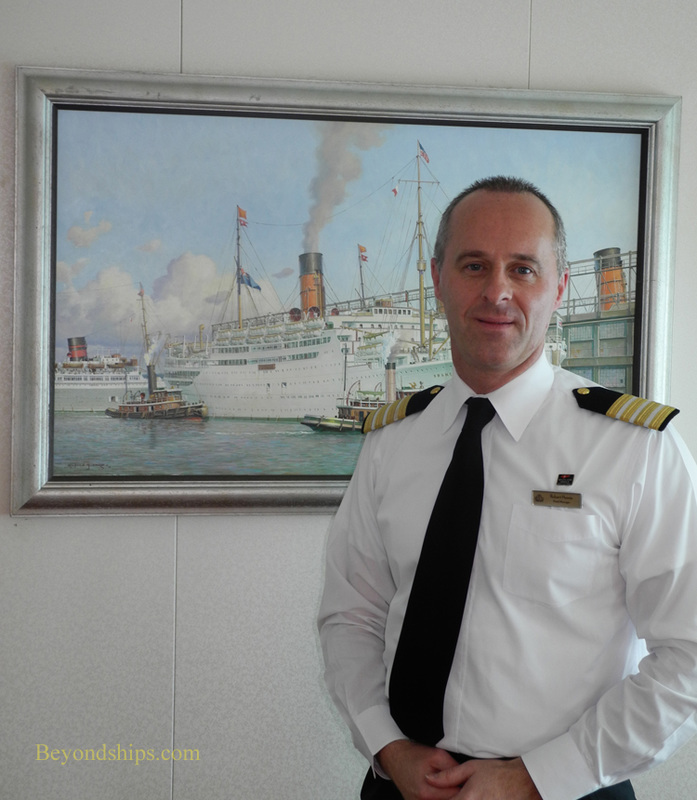 ​QM2 has a diverse collection of contemporary and marine art including works by Giancarlo Impiglia (read interview with the artist) and by Captain Stephen Card (read interview with the artist). 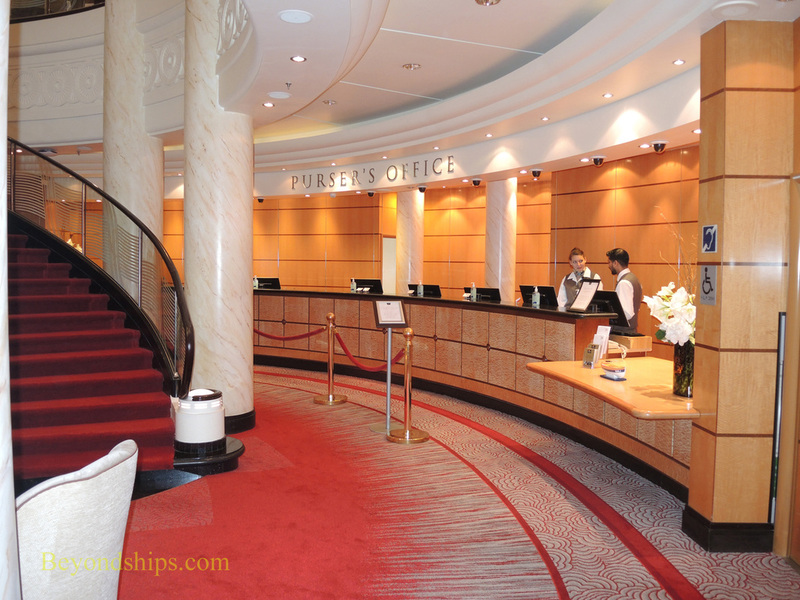 The Pursers Desk (above) in the Grand Lobby is the ship's reception desk. 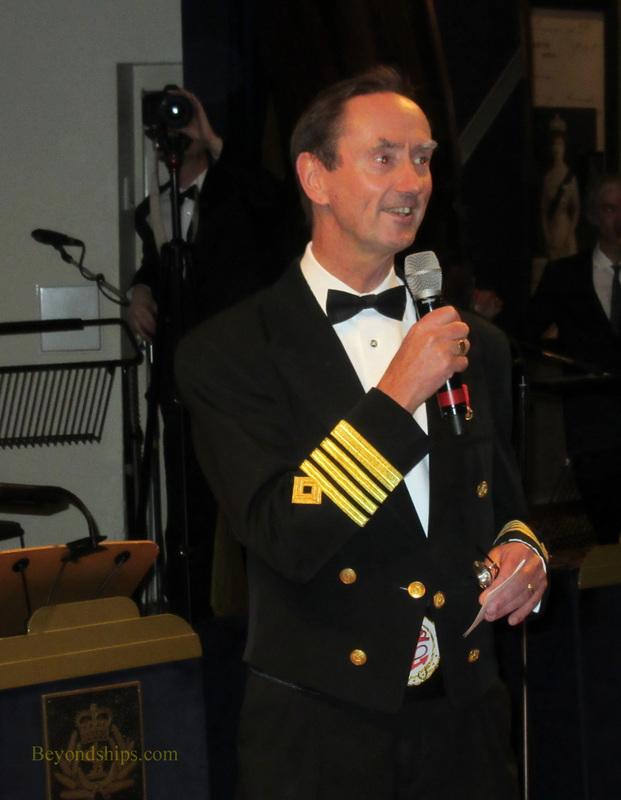 It is the place to go for questions and to interact with the ship's management. 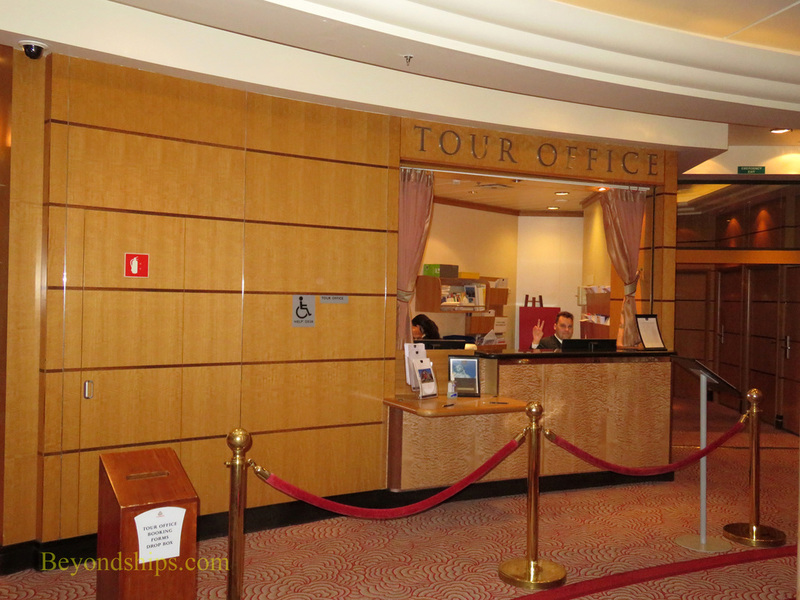 Next door is the Tour Office (above right) where guests can arrange transfers at the end of a crossing or book shore excursions on a cruise. 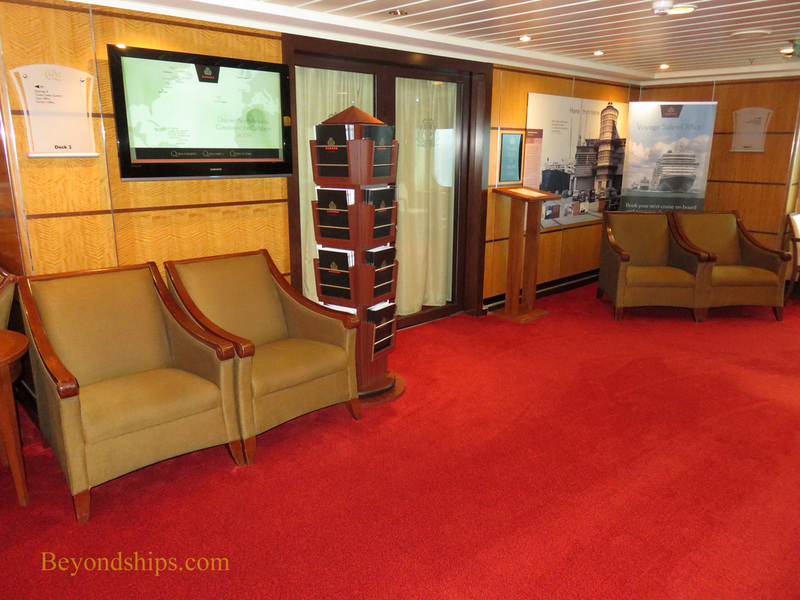 The Future Voyage Office (right) is also the onboard headquarters for the Cunard World Club, the line's repeat passenger program.